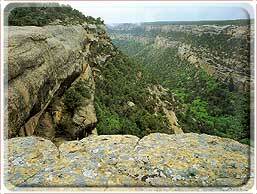 Mesa Verde National Park is open year-round, however, some facilities, tours, and archeological sites are seasonal. To make the most out of your trip, take a look at the Park Schedule to see what will be available when you visit Mesa Verde National Park. 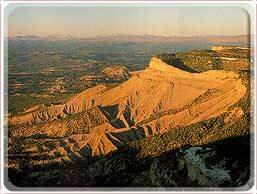 Mesa Verde National Park is located in southwestern Colorado midway between Cortez and Mancos off US 160. From the highway to the park headquarters is 21 scenic miles and about a 45 minute drive. About 15 miles from the highway is the Far View Visitor Center and 4 miles from the highway is Morefield Campground. 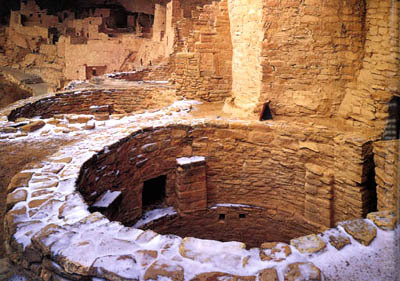 When you arrive at Mesa Verde National Park, the first thing you should do is visit the Far View Visitor Center which is open summer months (early June through Labor Day Weekend) or the Chapin Mesa Museum which is open 8am-6:30pm during the summer and 8am-5pm during the rest of the year. The Visitor Center features exhibits that focus on the contemporary American Indian cultures in the Four Corners area. You'll also find books and postcards at the bookstore. From there a park ranger can help you plan getting the most out of your visit. He'll give you the choice of visiting Chapin Mesa or Wetherill Mesa. Click Here to view maps of Chapin Mesa and Wetherill Mesa.